This project was started by Juha Vierinen and was the first attempt to build the coherent receiver based on the RTL-SDR technology. The quartz clock on the slave units were desoldered and slaves were connected to the master RTL dongle clock. The author provides some measurements in his blog that confirm that the systems do not have detectable sample drift over a two hours period, and the relative phase remains quite stable. This solution has a hardware limitation of 3 dongles. Juha Vierinen explains that he used the FM radio signal to calculate the cross-correlation function. Moreover, in the comments it was added that the white noise signal was also tested, but there are no further test results presented. Juha Vierinen also wrote that they were a bit surprised that they could do this with 8 bits. In fact, the results were not that much different from their 16-bit receiver (USRP N200). More details on this project were provided during the hackaday 2015. Juha Vierinen wrote a book “Practical Software Defined Radio Remote Sensing (Modern and Practical Approaches to Electrical Engineering)” that “shows how software-defined radio instruments are used to build working radar systems in practice”. The book is available from 15. August 2018. It will be assumed that the delay remains constant over time. Moreover, experiments showed that the delay remained constant by switching the dongles to other frequencies. This project uses the same idea as the Multi-RTL. A single 28.8 MHz reference clock is distributed to all dongles. This makes their sampling rates and local oscillator frequencies equal but does not guarantee that they will actually sample simultaneously or that their local oscillators will be in the same phase. As explained, this happens due to the delays in the transmission between the antenna and computer memory. The proposed solution is to switch the input from the signal to the white noise source, e.g., by frequency change. The delay is calculated using the cross-correlation function. The hardware design in this project is also limited to 3-4 dongles. 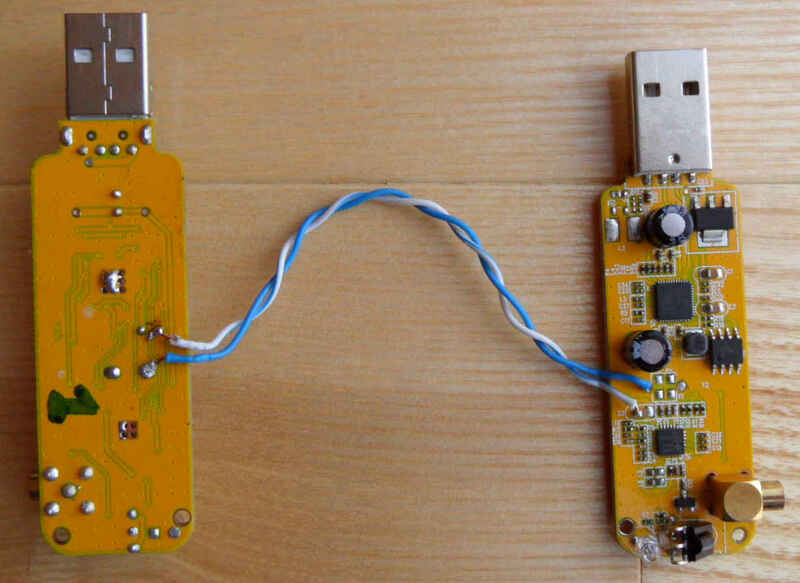 This mini-project describes a hardware hack that enables the connection of two dongles to the same clock. The principles are the same as in the above mentioned projects. 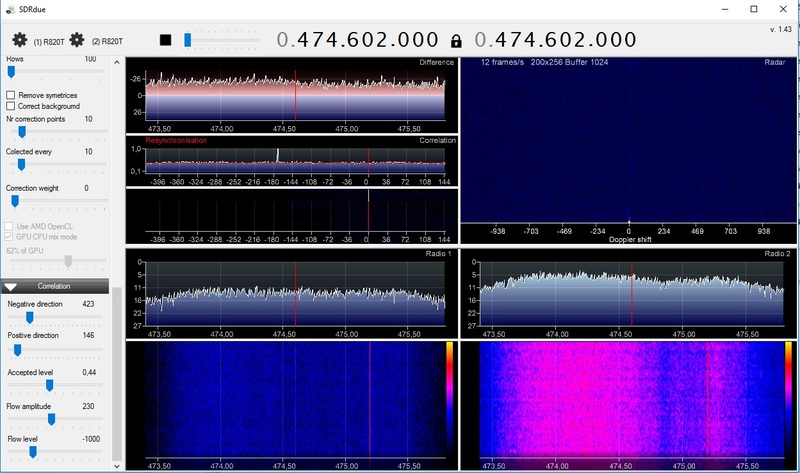 Oscar Steila describes in his IK1XPV blog a SDR coherent receiver named 3radio. This is a compact device consisted of 3 RTL-SDR dongles. The hardware and software architecture are explained. Moreover, the description includes some test results from the hardware performance evaluating different forms of the input noise signal. Different cross-correlation results are discussed as well. YO3IIU uses an external CDCLVC1310-EVM board in this project. This board supports up to 10 clock outputs which can be connected to the RTL2832-dongles. In his experiment, YO3IIU connected 4 board clock outputs to the RTL-SDR clock inputs. Some practical results are presented. CDCLVC1310-EVM costs $149.00 (USD) and such coherent system is restricted up to 10 channels. Dr. Daniel Michał Kamiński creates a new program SDRdue to use it as a passive radar. The program supports only two dongles at the moment. The source code is available on request. Marcus Herber has developed the real time passive radar with clutter suppression and automatic target acquisition as a part of his final year of electrical engineering at the University of Queensland. The flowchart shown in the video gives an overview of the whole system. Marcus generates range-Doppler maps using the complex ambiguity function https://en.wikipedia.org/wiki/Ambiguity_function in order to detect targets. The processing was too complex and far slower than real-time on the ordinary computer (1 second of data took about 20 seconds to process). Therefore, he decides to use the NVIDIA’s CUDA, which allows users to access and execute code on NVIDIA GPUs. The result: t 1 second of the data is processed within about 0.9 seconds. The potential for further development is very promising, as this was all implemented on a cheap RTL2832U-based dongle, and a low-end consumer graphics card. The number of frames per second, range resolution, clutter suppression and closing rate resolution are among the critical components of the system that could easily be improved by using better hardware or increasing the number of receivers. TDOA Transmitter Localization using three RTL-SDRs to localize signals in a city. First two applications can be easily realized using the proposed architecture. The third scenario is more complicated. The phase and time coherent demodulation of two receivers requires the same phase of the tuners PLLs (that are fractional-N synthesisers in case of MSi001) and it is not sufficient to provide only the same clock reference to the tuners (see our support section for more details regarding the fractional-N PLLs). Therefore passive radar or direction finding applications cannot be implemented using RSPduo only and will require antenna switches and a common signal source, e.g. our antenna switches with a noise source or antenna switches with the source expansions + some kind of signal source like a signal generator or SDR transceiver. It is unclear at the moment under which license agreement the module will be released and which functionalities (e.g. DOA, Passiv Radar or Beamforming) will be included. Xuan Liu: “Time, Phase and Frequency Synchronization of Low-Cost DVB-T USB Receivers acting as Software Defined Radios in a Multi-Channel Coherent Receiver“; concept and implementation for Building a four-channel coherent receiver with RTL-SDRs. M.J. Ryan submitted a dissertation “Low Cost Passive Radar Through Software Defined Radio” that “aims to determine the suitability of low cost USB TV tuners as hardware receivers for a Software Defined Radio (SDR) based passive radar receiver. Subsequently determining its effectiveness in producing inverse synthetic aperture radar images using data collected from Digital Television signals. Research was conducted into the available SDR receivers, and comparison of specifications was made against the low cost receiver used in the project. A functional hardware platform based around the Realtek RTL2832U chipset has been developed to determine its suitability as a low cost receiver verifying its ability to coherently receive radio signals for target identification. A complex ambiguity function was implemented to interpret sampled data windows, with the output of these windows to be compared to the requirements for an inverse synthetic aperture radar input, thus determining the suitability of the device”. W. Feng, G. Cherniak, J.-M Friedt, M. Sato investigate in the paper “Software defined radio implementation of passive RADAR using low-cost DVB-T receivers” the use of RTL-SDR receivers for passive radar applications. Authors demonstrate the detection of static and moving targets as well as short range targets. Technical challenges of diverting consumer electronics for passive radar applications are discussed. In the presentation Jean-Michel Friedt shows a GNU Radio passive radar implementation utilizing two coherent RTL-SDR dongles . These blog posts describe the realisation of the passive radar on the Adalm-Pluto board.